Dipped in the richest chocolate ever. I’ve never liked shortbread! Never ever ever. Lots of evers here. I always thought it was dry and boring and lacked flavor and was very much a grandma cookie. Since I’ve started doing elderly things anyway, like eating desserts with nuts and enjoying pecan pie and craving lemon cookies, I figured, why not? Let’s try some shortbread. And by “try some shortbread,” I mean let’s trash up regular short bread almost as much as possible. But I didn’t. Whomp whomp. I think peanut butter and chocolate is just enough. The salted peanut butter cookie is dreamy and crunchy but buttery and almost melts in your mouth. If you’re an absolute peanut butter freak, these are calling your name right now. Hurry hurry. Few days before Christmas. Go for it! If you’re like me and need a touch of chocolate with your peanut butter (or let’s be a real, a touch of peanut butter with your chocolate), a corner dip is just right. And then, the salty sweet… well that’s all anyone needs. I realize I’m going a little heavy on the exclamation points today, but these cookies are worth.it. As much as I turned my nose up at every and any lorna doone my entire life, I’m slightly regretting that decision. Or wondering why they didn’t put peanut butter in their dough. I almost… a very close almost… made shortbread with fresh herbs. You know, something like lemon thyme or lavender rosemary or vanilla basil and all that jazz. It sounds pretty darn good, right? But, that is just not me. At 10:07 on a Sunday night I am not sneaking into the kitchen to grab a lavender rosemary cookie. I am grabbing a big honking spoon of peanut butter covered in chocolate chips or a chunk of perfect chocolate dropped in the PB jar or even a scoop of chocolate peanut butter ice cream. I wish it was different and that I LOVED those lighter, more sophisticated desserts, buuuuuut. I’d rather constantly faceplant into a peanut butter cup stuffed chocolate cookie or something. 130% of the time. Real life: my palate is comparable to a seven year old’s. Now I just know that you have room and time left to make ONE more cookie right? They are so super simple, require just a few ingredients that I’m almost positive you have on hand and don’t take very long at all. They are sort of like slice and bake cookies too, without the imprinted green christmas tree in the center. But sooo much better. And we can totally bond over our adoration for chocolate peanut butter. There is no comparison, ever. In the bowl of your electric mixer, beat the butter and peanut butter until creamy and combined. Beat in the sugars on medium speed until fluffy. Add in the vanilla extract. Beat in the flour on low speed until just combined. Scoop out the dough (it will be crumbly) and form it into two tubes with your hands. They should be about 2 inches in diamter and about 6 to 7 inches long. Wrap them in plastic wrap and refrigerate for 30 to 60 minutes. Remove the dough from the fridge and cut 1/4 to 1/2 inch slices off the tube. Place on the parchment. Sprinkle each with salt. Bake for 20 minutes, or until just slightly golden. Let the cookies cool completely before dipping them in chocolate. To melt the chocolate for dipping, microwave it (or heat over double boiler) for 30 seconds at a time on 50% power. Stir after each time until it just melts. Once melted, stir in the coconut oil. Dip an edge of each piece of shortbread and if desired, sprinkle with more salt. Thissss is a short stack. I’ve actually made peanut butter shortbread before and DIED over them. I used powdered peanut butter though as I wasn’t sure how to incorporate the real stuff into it. Now I know! Grandma cookie lol. You made me laugh. I love shortbread, but I’ve never tried a peanut butter version before. These look delicious! SUCH a shortbread fan over here!! The butteryness. The thickness. Oh man, love it. Never ever thought to combine shortbread with PB. Genius! If I don’t have coconut oil on hand, is there something I can substitute for it? you can leave it out! it just helps the chocolate firm up – will be totally fine without it. Your version of doing old people things is so much “younger” than mine! Eating nuts vs. crocheting. I’m literally 80 at heart :) I also LOVE shortbread cookies even before you made them irresistible, YUM! Yum! I love shortbread cookies and these look delicious! These sound incredible! I love the idea of salted peanut butter! Pingback: Just Cooking News / Salted Peanut Butter Shortbread. I don’t like shortbreads either, but they are my husband’s favorite. Maybe this is a way for me to meet him in the middle, because I’ve never met a chocolate-peanut butter combo that I didn’t like! You have to try herbed shortbread! It’s amazing, I always make rosemary shortbread. This year I added melted white chocolate spread on top. They are to die for. Could I substitute something for the coconut oil. It’s the only ingredient I don’t have. Thanks. yep you can leave it out! it just helps the chocolate firm up a bit, but it will be fine without it. I always dipped Lorna doone’s in peanut butter. Problem solved! Ok….you convinced me that I do have time for one more batch of cookies!! 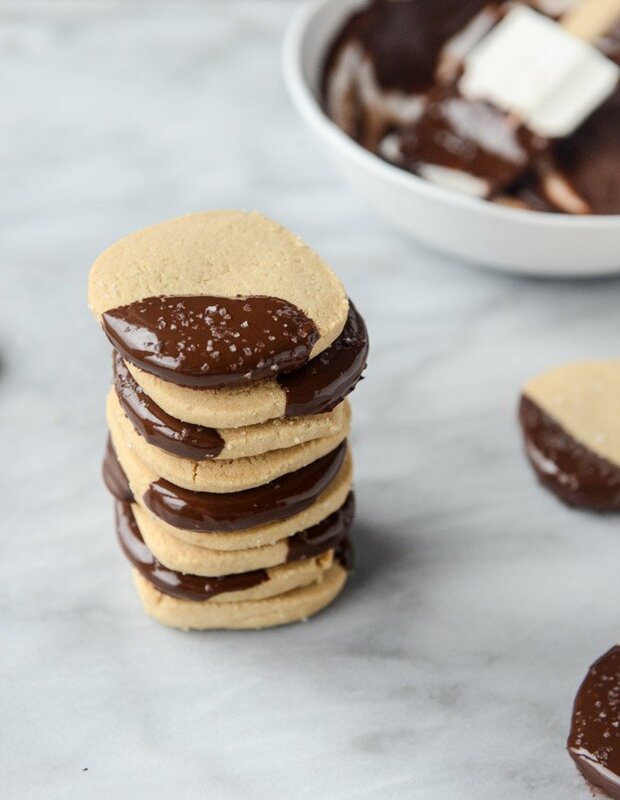 Can’t resist the pb and chocolate combo….making these today!!! 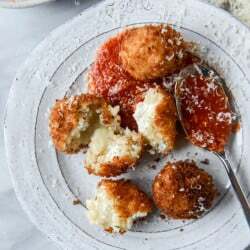 I tried to make these this afternoon – no luck. :/ The dough was crumbly like you mentioned, but they were so crumbly that they wouldn’t go into a log and did not slice after chilling….they just broke back apart into crumbs. Any suggestions? I feel like maybe more than just 1 cup of butter is needed…. I had the same issue just now.. Bummer! I’m having the same problem! Wish I had read the comments first and I would never have made them. The photos were so awesome. Now that I look at the Ina recipe this was adapted from, I’m thinking maybe 1 cup peanut butter (up from 1/2 cup) and 1 cup butter to have enough fat to hold everything together. hi guys!! so sorry they crumbled on you. when did they crumble, at the beginning, or after refrigeration? i found if i refrigerated longer than 30 minutes, the dough started to crumble when sliced. i tested them with 2 different kinds of creamy PB (jif and skippy) and both worked for me – i simply swapped out 1/2 a cup of butter in ina’s recipe for the PB! i know they’ve worked for a couple others on twitter and insta (under the howsweeteats hashtag) and im going to make more today for my cookie tins so ill keep you posted. if you try more butter, let me know how it turns out. if anything, i’d think maybe a drop (like 1-2 teaspons) of milk may help it come together?? Hi Jessica, thanks for responding! They were pretty crumbly coming out of the mixer, but I didn’t think anything of it at that point because of your comment in the recipe. But then the crumbs wouldn’t come together to make a log – finally got it sort of thanks to some plastic wrap. But if I moved the log, it would crumble again. I thought the refrigeration would meld it back together, but after about 40 min of chilling, they still hadn’t come together. I smashed some dough together to bake, just in case, but came out super dry. Which would be expected from crumbly dough. I’m so glad other people got it to work – I’ll have to check out instagram. I’ll let you know if I try it again! IMO this recipe has about 1 cup too much flour in it. I’ve made a similar shortbread cookie that has a dough that’s easy to work with, but only has a little over 2 cups of flour compared to the 3 1/2 in this one. In comparison, I found this dough to be utterly impossible to work with and frankly kind of a nightmare. 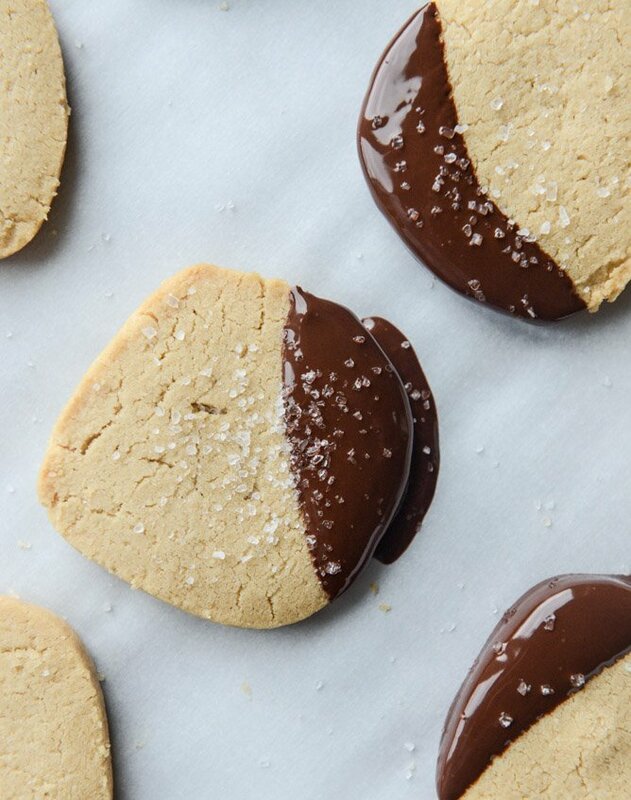 I turn my nose up at shortbread cookies too, but my husband loves these and this flavor combo….well, if I make these for him, I think there is a pretty good chance that I could get him to buy me that Le Creuset braising pan I’ve had my eye on for months. You lost me at peanut butter!!! I love short bread I to have to try and make this!! I made these yesterday and they were crumble mess and would not form into a log AT ALL. So I came on here and read the comments and added milk and it totally worked. I doubled the recipe to start with so I had to add a lot of milk – probably close to 1/4 cup. I was just so happy to have the fix – couldn’t deal with throwing out that much dough!! They came out great – used Ghirardelli 60% Cacao chips. Highly recommend!! Made these and threw them in the garbage. They were a crumbly mess that would not come together at all. These look AH-MAZ-ING! I’ve always loved your recipes. I still go back to your butternut squash ones from a few years ago. Brown butter, anyone?? I love the buttery simplicity of shortbread, and I’m a complete freak for peanut butter, so I’d say yeah, these are definitely calling my name. Can’t wait to give them a try. These look amazing. I’m a huge fan of shortbread and was looking for a peanut butter version. Two questions – can this be made with natural/unsweetened peanut butter? I make my traditional shortbread in a 9X13 pan – can this be made the same way or perhaps in a 9×9? Made these exactly as described, and ended up with a dough that was too crumbly to hold a log shape and allow cutting – even after a long stint in the fridge and another in the freezer. Had to work the dough for a good 10 minutes by hand just to get something that would form a ball. The final product tastes too dry, not enough peanut flavor. If I make these again, will consider cutting the flour by about a cup. A tablespoon of milk and a cookie cutter completely saved my crumbly mess. Could the crumbling be due to too much flour? Can you tell us How much flour to use by weight? You said the dough would be crumbly, and you were right! It just crumbles when i cut it. Any suggestions to save it? I added 1/4 cup of butter and 1/4 cup of peanut butter to address my crumbling issue (after unsuccessful log shaping attempts). Then, I was able to roll and cut after refrigerating for 60 min. 2 1/2 cups of flour and 2 tsps of vanilla instead of 3 1/2 cups of flour and 1 tsp vanilla and this recipe turns out perfect. I also added 1/4 tsp salt instead of salting the tops.